This page contains what I consider to be important information for any grandparents out there..
My wife and I were lucky enough to have our Grandson Kane stay with us for a few weeks at the end of March to the beginning of April, 2009. The first week was full of Kane getting used to being away from his Mama and Dada at home, and our routines in this household, so we spent most of that time adapting to living with each other. The first full weekend he was here, I had to travel for work on Sunday, so I held off on most of my "plan" until I returned home from my business trip the following Tuesday. 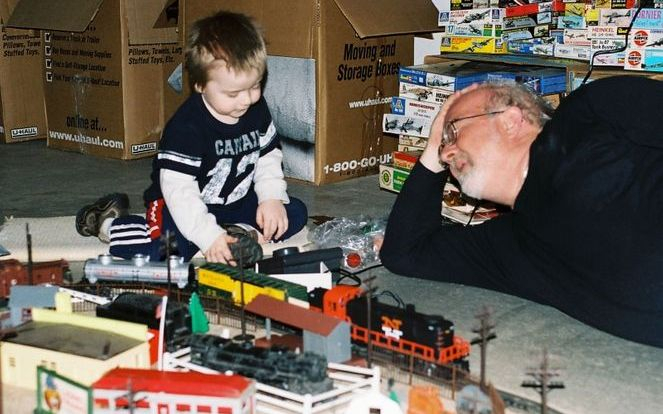 Basically, the plan was to see if my grandson had any interest in trains. With so many contemporary diversions, trains might somehow seem anachronistic or prehistoric to today's 2½ year old! Of course, I'd like to just buy him trains, build a layout with him and have him enjoy my hobby the way I do, but that seemed a tad presumptuous to me. "Take it slow", I thought. Little did I realize how so many unrelated (at the time) events led up to my plan and his visit! 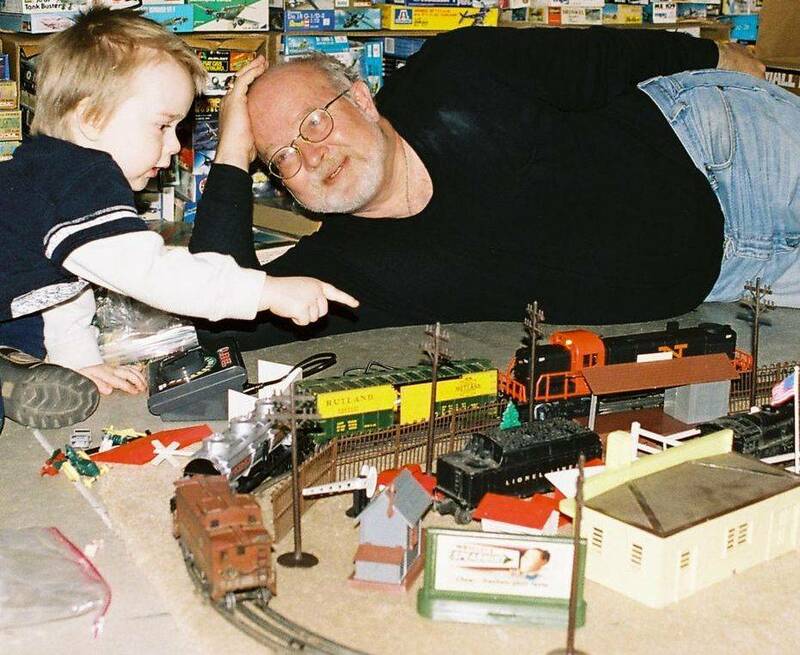 I won a Lionel 027 train set in a supermarket raffle a few years back when we lived in New Hampshire. This was the uncatalogued Lionel 31950 KRAFT/NABISCO HOLIDAY 2002 train set. The set came with a 77Watt transformer, an oval of track, a box car, tank car and Union Pacific caboose and matching Alco RS-3 - the kind of locomotive where the trucks are attached to the front and rear pilots so the engine can negotiate the sharp 027 curves. 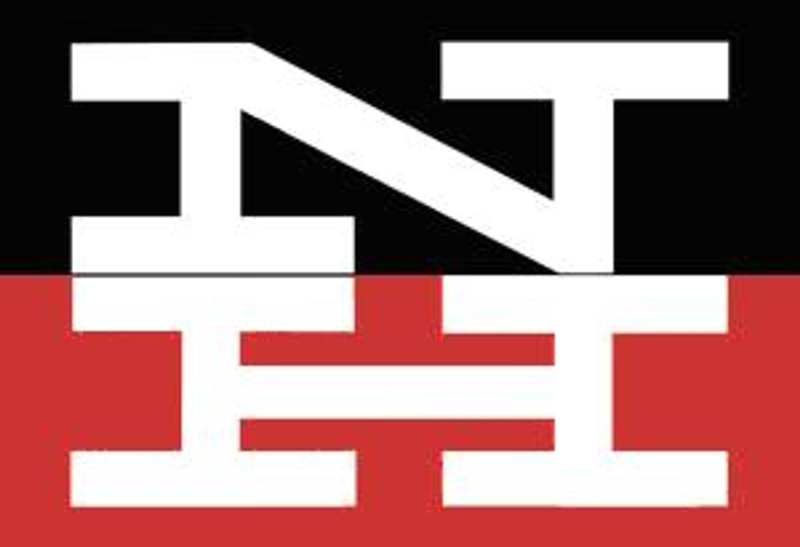 While I have nothing against the Union Pacific, I am a New Haven modeler and this is a New Haven modelers' web site, so that railroad just wouldn't do for my Grandson! In the week before my business trip, I quietly took the Union Pacific RS-3, some Engine Black and Testors Hemi Orange paints, and some O scale Microscale decals along with a reference photo, and transformed the RS-3 into New Haven engine 559 in the McGinnis or New Image paint scheme. Fortunately, in years' past when my wife and I went to estate auctions frequently, I had on occasion picked up several box lots of HO equipment, and in a couple of cases, those boxes contained Lionel O and 027 items. So, I had accumulated a steam engine and tender, a lighted caboose, an operating searchlight car and several other pieces, as well as some O gauge track and a couple of turnouts. Also, through the kindness of someone where I work that had some "junk train stuff" she could find no buyers for at on-line auctions, I had a few more Plasticville buildings and other accessories like telephone poles, billboards and the like. And yes, I did tell her these items had values (at least to me!) before accepting them, and I thanked her VERY much! When I returned home from work on Wednesday, I hurriedly went to the basement (i.e., "Man Cave") and pulled out the freshly painted New Haven RS-3 (equipped with "horn sound" and lights), my Lionel Lines caboose, some boxcars and tank cars and assembled an oval of track and plugged in the transformer. I applied power to the track and the engine worked, so I called Kane downstairs to see what Gran?pa made for him. 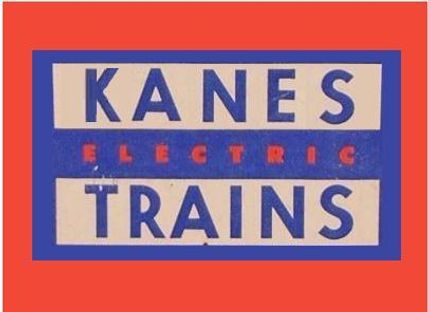 I wanted to see if bringing trains into Kane's life would be meaningful for him or not; so many DVD's to watch and cartoon TV shows, and some books to read; maybe trains wouldn't be to his liking. I'll let the photos do the talking. While the train was running around the oval I showed Kane which button on the transformer to press to blow the "horn" and how to make the train stop, go forward and back up. We also began to put the buildings on the layout in between watching the train go 'round and blowing the horn and stopping and starting the train. We ended up with a pretty good-sized "town" inside the oval with a fire station, diner, passenger station, freight depot and a farm of sorts. Kane got the hang of this model railroading thing pretty quickly - he stuffed most of the available barnyard animals, people figures and farm implements into his two boxcars. He seemed to clearly understand that all kinds of things could be shipped in boxcars! 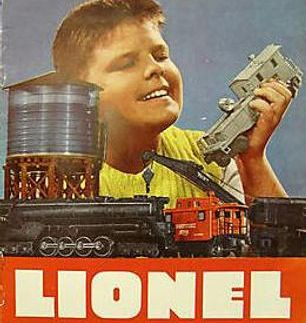 This is what I call "the Lionel Catalog photo". I was watching Kane when my wife took this photo, and at the time, I hoped she got Kane when he was in this position. Kane was enjoying running his train around the track and pressing the button on the transformer to blow the locomotive horn. He had just pressed the button and sat up to point at the train as it blasted past him. When I saw the look on his face, the artwork in the old mid-?50?s Lionel catalogs jumped into my mind. I thought to myself; This is the look on a kids face they tried to capture, whether is was in a drawing or a staged photo, and here I was ringside to the real deal!!!! Well, since it was obvious (to me, anyway) that "Engineer Kane" liked trains okay, I decided it was time to go the rest of the way. We ran the trains on the basement floor for about a week while I thought about what kind of layout I could make for his trains - the coffee table in the living room is a good height for him when he's standing, so the layout height would be 20". He was very good at running a train around an oval, so the oval of track would be on the layout. He would recognize the oval as being "his" even if the track was no longer on the floor and there were other things on the layout as well. Since Kane owns both a steam loco and a diesel, I wanted him to be able to run both in trains at the same time. I didn't have enough O gauge track to make a bigger oval, so I did have to go the hobby store for some track, and although it was expensive, I picked up an old refurbished Lionel 1033 90Watt transformer as well. The layout is something like 5'W x 6'6"L. The benchwork is made from 1"x4"s around the edges and spaced on about 19" centers from side to side. The top is 1" foamboard. As I develop the layout more, I will remove a section of this in one corner to locate the transformers and other electrical gear on a piece of wood rather than keep it on the foam permanently. I think the photos show Kane likes "toy trains" (he can say "choo-choo" and railroad, as well as boxcar and caboose!) And I will make some improvements before his next visit so he will enjoy it more. This may be a more contemporary Lionel shot with Kane giving his layout "two thumbs up". Kane demonstrated a lively interest in his trains before leaving, so I decided to upgrade his layout before his next visit. The first step was to add a river that would be crossed by a postwar Lionel 214 girder bridge for the O Gauge track and a new 6-62716 Extension bridge for the inner O27 oval. The "source" of the river is the Plasticville pond with footbridge located in the park. I cut the 1" foam benchtop to make the river and hollowed out a section for the Plasticville pond. I used Liquid Nails for Projects to glue another piece of 1" foam under the benchtop to make the river bottom. Also in the photo you can see the beginnings of sidewalks to line the street. The sidewalks are made from sheet styrene that I scribed with the back side of a hobby knife blade to resemble sections of concrete walk. I used HO gauge Woodland Scenic track risers to raise a portion of the 027 oval to 1" above the benchtop level, so this track is 2" above the river. I think the difference in elevation of the two tracks adds interest. For each type of bridge I made different piers; I made a simple concrete style from sheet styrene for the girder bridge. For the extension bridge I made an older style of bridge pier that resembles a type made from cut stone. I first cut the shapes from sheet styrene then scribed sheet balsa using a mechanical pencil to scribe and outline rectangular "stone blocks" at the same time. I used Walthers Goo to overlay the scribed balsa onto the styrene shapes. I think they turned out pretty good (better if I weather them sometime) and again, add some visual interest to this area of Kane's layout. I made the river using acrylic paints - black in the middle, blended with a dark green applied in a band outside the black which was blended with a medium blue applied near the river banks. This was allowed to dry then I applied a series of acrylic gloss medium overcoats - about 10-12 coats in all to add some depth. In this photo you can see the Plasticville pond and footbridge by the park to the left, the extension bridge atop the "cut stone" piers supporting the 027 inner loop and the girder bridge on concrete piers on the O gauge track. To the right of the extension bridge next to the track that is rising towards the bridge on the Woodland Scenics foam riser, you can see the top stepped surface of the concrete retaining wall I built to put against the riser and between the track and Plasticville Hospital and Fire Station. The retaining wall was also built from sheet styrene. The trick for this project was that the steps had to be low enough so as not to hang up the locomotives and rolling stock as they climbed the track to the bridge. Above is an overview of the layout as Kane will see it during his next visit. The train on the inside 027 track is led by the re-painted RS-3 from the 2002 issue Kraft/Nabisco train already described. Most cars in this train are from that set with the exception of the car before the caboose which is a late-era Lionel 9031 NKP gondola. The caboose is an Lionel MPC/Fundimensions 9380 New Haven cupola caboose that I fitted to a postwar 6457 lighted caboose chassis. The train on the O gauge is all postwar Lionel; a 2026 steamer with 6466WX tender (original was a 6466T); followed by a 6465 Sunoco oil car, 6464-300 Rutland box car, 6436-1 Lehigh Valley hopper and a 6457 lighted caboose with couplers on front and rear. Also in this photo you can see the completed sidewalks and streets. The streets are painted with a "charcoal" acrylic paint and I used 1/4" paper-sided foam board to bring the streets up to track level at the crossings. A variety of Plasticville autos are cruising around town which includes (left side of photo) a crossing shanty, hospital (I rebuilt the roof and front awning - no interior), fire station and just barely in view, diner. On the other side of the street, starting at the end opposite the diner are another crossing shanty, station and platform and super market. Separating the 027 and O gauge track near the station and behind the super market is a plastic hairpin fence of unknown origin. In the far right-hand corner is a Plasticville farm yard and between the O gauge track and siding are (from rear of photo) a Plasticville signal bridge (located over the switch between the main line and siding) water tower, loading platform and railroad work car. The switches for the siding are postwar 022 remote control switches and you can just see the two lighted control levers above the caboose on the control panel. The only other structure on the layout not visible in this photo is the Plasticville switch tower. The signs are a mix of Plasticville and Lionel and the streetlights are old Life Like HO scale products that I think are just right for this layout. Knowing that Kane would be here for Christmas was a great feeling! 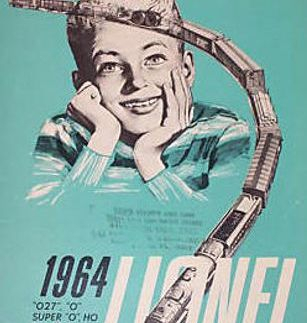 After his last visit I pulled together a plan for his Lionel Christmas gift - remember, I'm willing to put a lot of time and effort into this, but there's not a lot of spare cash lying around. The one thing Kane didn't have was a passenger train. In the 2009 Lionel catalog a "Pullman Expansion Set" was listed that consisted of three passenger cars, a station platform, three billboards and four sections of track. The total cost for this package was less than I would pay (list price) for three HO scale passenger cars for my layout, so I considered it an economical investment for Kane. In addition I also picked up another New Haven locomotive and tender on an internet auction site for a reasonable price. What made the price reasonable is that this particular loco and tender were made during the Lionel MPC/Fundimensions era which is only now growing in popularity with some collectors. The 8007 loco was originally packaged in a set I recall seeing for sale when it came out. I believe the set was called "The New England States Flyer" I know it included the loco and 9380 caboose that I now have. This locomotive was made in the brief period of time that Fundimensions used DC motors instead of traditional Lionel AC (3-rail) motors. The loco also featured a "glowing firebox" (red light bulb) and "Choo-Choo" sound tender - there is a huge hollow wheel hung in the middle of the tender and it contains ball bearings. The wheel rests on the inside rail of the 3-rail track, spins around, and the tumbling ball bearings (maybe they're B-B's) make the sound...sigh. OK, so the loco body is a very good plastic casting and it came with a 2-6-4 Baldwin disk drive wheels. It's now sitting on on a postwar version (675?) of the chassis with AC motor. While the tender shell is a 6026 type, it is plastic and marked as an MPC 8050-1 part. The shell is now sitting on a 6026W chassis - gone is the "Choo-Choo" big wheel! I mentioned earlier that three billboards were included in the Pullman Expansion Set. Imagine my astonishment when I opened the large box to individually wrap the passenger cars and found one of them to be perfect for Kane's layout! Thanks, Lionel! The picture to the right shows some last minute shoppers out on Christmas Eve in Plasticville. Kane has already seen his upgraded layout before Christmas and even helped glue down some lichen to add to the scenery. Late on Christmas day after opening many, many, MANY other presents and playing with almost all of them, we snuck down to his layout to run his new passenger train! Next...building a mountain out of less than a mole hill and adding some Lionel postwar accessories...oh, my wife has decided that Kane has enough TRAINS, but not enough TRACK to run them on. I have been told that I have to expand the size of his layout!!! Did I tell you how smart my wife is? In some of the earlier photos on this page appears pink material that clashes dreadfully with the green tabletop. Fear not, this is only a temporary condition and in the near future all will return to complimentary colors. Before Kane arrived for this visit I purchased some contemporary Lionel 6-12896 Tunnel Portals and positioned them on the curves of the two tracks beyond the bridges spanning the river. 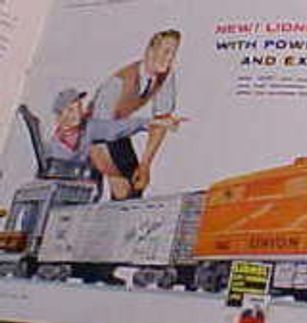 These are reproductions of parts made in the postwar Lionel years except they have "Lionel" embossed across the top in place of the original "Hillside". No matter, they blend in well. For the mountain itself I used broken up pieces of 1" foamboard and Liquid Nails For Projects adhesive -not all versions of Liquid Nails are foamboard-compatible and may contain a solvent that will dissolve the foamboard. As the series of photos shows, there are some tight clearance spots on the outer track, so the slope of the sides of the mountain is relatively steep - but then again, it IS a toy train layout - and in one area I decided to use sheet styrene to build a vertical "concrete" retaining wall. Because most of this work required leaning into the layout, I did this part of the mountain without Kane's assistance. The third photo shows that the "Twin Peaks" of the mountains are also built from broken up sections of 1" foamboard to create a skeleton structure which was subsequently stuffed with crumpled up newspaper Kane did help with the last two steps using a scrap piece of sheet styrene to dab Liquid Nails onto the ends of the foam as I put the pieces together to make the skeleton and with crumpling and stuffing newspaper. Unfortunately, I was not able to scout up a photographer during these steps to document his contributions but it was as much fun for him as shown in the rest of the photos. Once the mountaintop was formed with foamboard and crumpled newspaper we entered the "Goopy" phase of the project. Because the mountaintop is a separate part from what is attached to the layout, we spread a plastic bag on the basement floor and worked on the mountaintop in reasonable comfort. The following photo series shows Kane learning how to, and then applying plaster cloth over the formed mountaintop. ADULTS PLEASE NOTE: Kane is adorned with approved protective safety clothing (a t-shirt donated by my wife) in order not to ruin his own clothing. Keep this in mind if you attempt this at home. With the plaster cloth dried to form a hard shell over the skeleton we moved on to new adventures. I used a papier-mache product called Sculptamold to cover the plaster cloth and provide an acceptable surface texture to the mountaintop. For those unfamiliar with plaster cloth, when dry it appears somewhat like gauze or cheesecloth which does little to convince the viewer they are looking at "landscape". Sculptamold is mixed with water. For the mountaintop I mixed it to a consistency thinner than cookie dough but not as loose as pancake batter. I added a water-based acrylic raw sienna craft paint as a tint for a couple of reasons; the Sculptamold dries nearly bone-white otherwise, which photographs terribly and, should some of the scenery (to be applied later) chip off the surface, the added tint means there will not be a brilliant white spot exposed from the chip. Kane and I attacked different parts of the mountain with plastic spatulas to apply and spread the Sculptamold over the plaster cloth. Once again, Kane is wearing approved protective clothing and we are working with the mountaintop situated on a plastic bag to protect the basement floor as well. VIOLA! A MOUNTAIN IS MADE! Here's the current status of the mountain. I'm tentatively naming it Billy and I'll see if I can find a suitable tree named Ethel to plant on the mountainside. I'll have to finish working on the vertical surfaces of the mountain below the mountaintop without Kane's help but at this time I'm planning to hold off on additional scenic detail of the mountain until his next visit later this year. Overall I think he did a great job! Next time someone tells you scenery is difficult, just tell 'em "it's so easy a 3-year-old can do it!" And you know where to show them photos to prove it! In April, while Kane is away for now it's time to expand his layout. After my wife told me Kane had too many trains and not enough track to run them I began planning. The expansion will be built in two parts over time so that each part can be wired up and running in a short time. The first part is an oval with a reversing loop and passing siding. The construction method is the same as the original benchwork; 1"x4" pine fashioned into an open grid with 2"x2" legs screwed together with sheet rock screws. The benchwork is covered with 1" pink foamboard that is secured with Liquid Nails adhesive for projects and painted with Ivy Wreath green (flat latex) from Walmart. The next step was to move the addition to the current layout and reposition both sections to fit the area, allow for future expansion and provide room to walk around. Here's how the layout looks with the addition in place. There are now Lionel 252 crossing gates installed at each road crossing to protect the Plasticville autos from collisions with the trains. In addtion, Kane has a new string of "piggyback" flat cars. These are all postwar Lionel flat cars with trailers atop for transport around the layout. The "Pink Mountain" is longer pink since the bottom section is now covered with a layer of plaster cloth. Here's the track layout on the addition. The connection to the old layout is from the passing siding that can be seen near the Plasticville water tower and freight station. The track cutting diagonally across the oval is the reversing loop. This will allow the train to change directions to travel to and fro around the layout for added variety. This photo is taken from the other side near the control panel. The panel will be extended to the right to hold the controllers for the new switches. The extra width along the straight sections of track is to provide room for more Lionel accessories and (someday) a Plasticville airport! But that farm on the far side of the layout sure looks like a good place for a cattle car or milk car, doesn't it? Before Kane's last visit in 2011 I installed some operating accessories on the expansion so I could get them up and running for Kane's enjoyment and to begin to show him that operating Lionel trains is more than headlights making shadows in a dark room, smoke, train whistles and trains running in circles. We all know those things are fun enough sometimes, but I want to continue growing Kane's interest for the long haul. On the layout expansion I installed a 445 operating switch tower wired to the 022 switches that connect the passing siding of the original layout to the expansion oval. Any time this a train passes over the back-to-back 022 switches on either the old or new part of the layout the watchmen move on their appointed rounds. On the passing siding of the expansion I installed a 132 automatic stop passenger station that is flanked on either side by 157 station platforms. I guess I was too excited because between isolating the section of track, wiring up the stop feature in the station and making sure the E unit was disabled on the locomotive I was doing something wrong and could not get the train to stop at the station. Since I purchased the station on an internet auction site I had no confidence the darned thing even worked, but a trip to my "Lionel guy" to check out the stop feature operation assured me it worked as advertised. Despite knowing the unit works, I still couldn't get it to function on the layout before Kane's visit, so I didn't spend any time drawing his attention to this item. He does like the blaze of light from the station and platforms, though. Since I have the 450 Signal tower operating on the old section of the layout, I installed a couple of 148 dwarf signals (1988 LTI version) wired to a couple of the 022 switches on the expansion. The dwarf signals had a black light cover and dark brown body that I repainted to be all black above the base, which was painted gray. The signals came with 153C contactors that can also be used for train control, but in my opinion, may not be as reliable as direct wiring to the 022 switches. Because the automatic stop station was giving me such fits I lost precious time and quickly put a few straight sections of track down parallel to the track opposite the new passing siding and adjacent to the farm fence seen on the left behind the signal bridge in the photo above. Along this section of track I installed (from left to right) the platform for a 3482 automated milk car set, the platform for a 3656 operating stock car set and finally the corral for a 3356 operating horse car and corral set. Because this is a separate, isolated track section (some day it will be a siding) I used a separate transformer as a power supply. One recommendation I came across was that using a variable power supply allowed better control for these operating accessories, and that is what I'm after. The automated milk car set uses a 2-button RCS controller for actuation while both the stock and horse car sets use old 148-100 switches. The milk cans that came with my 3482 car are not all original, so I had to do some sorting to keep the reproduction cans from jamming the mechanism. I need to get about 3 more original cans. The cattle with the 3656 stock car were also not all original. My Lionel guy pointed out to me you could tell the original from repro cattle by the orientation of the little nubs on the bottom. The stock car platform is tuned to work well with the original cattle, but I only have three, so there?s another item to pick up. The three original cattle shoot across the platform and fly through the car, so it'll be worth the cost and effort to get more original cattle. The 3356 horse car came with all original horses. I tried this car out before Kane?s visit and it operated pretty well. To my surprise, Kane likes to operate the cattle car and horse car at the same time! While the original cattle operate well, I think so much vibration in a small space affected the operation of the horses as some of them toppled when entering or exiting the horse car under this type of operation. Overall, Kane was "wowed" by the switch tower and operating cars. He is more impressed by the 450 signal bridge than the 148 dwarf signals, but that's okay. I will have to get the automatic stop station working before his next visit because I am sure he will be surprised when the train stops and starts all by itself. The only downside so far for me is that I have to learn how to do rapid-fire reloads of the milk cans - at least until his small fingers can learn to reload the car so he can take charge. At the moment, he can unload the car in much less time than I can reload it! One of my daughters snapped the photos below of Kane operating the cars. No, we could NOT get him to turn away from the cars to show us his face for the photos. You'll just have to trust me he was in heaven. The engineer hat and overalls were a gift from his other grandparents. 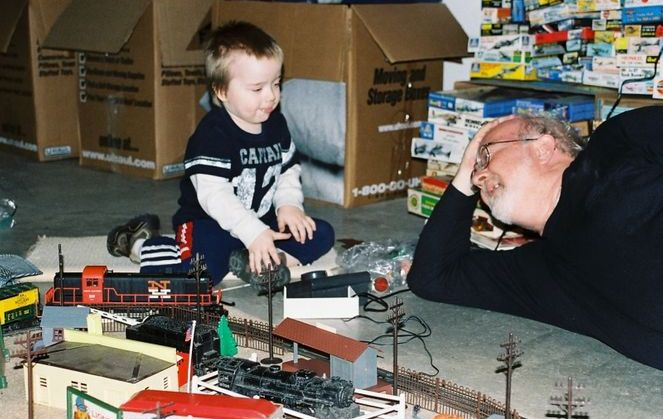 As usual, Lionel trains gets more family members involved than a lot of other activities! Happy railroading! whomever you share the hobby with!